While you may not be able to eliminate weeds entirely, you can certainly keep them in check by following some basic techniques. Even late into the season, the summer can seem like one prolonged fight against garden weeds. The bad news? There’s no winning this war; you’ll be engaged on the front lines so long as you wish to maintain a manicured landscape. But with the right tools and proper techniques, you can keep the enemy contained. Preventing weeds is the best way to limit their proliferation. The basic strategy here is to make your garden a less-than-hospitable location for unwanted plants. First and foremost, limit the amount of bare soil present in your garden, as empty patches of fertile soil are like oases for weeds. Instead, plant densely, use mulch, and consider taking advantage of the natural weed-suppressing power of ground covers or landscaping fabric, the latter being effective but artificial. Even the best practices won’t stop every single weed from finding its way into your garden, but by employing some or all of the following methods, you can stand your ground against their ceaseless incursion. Some gardeners weed only once a week, and surprising though it may be, even that frequency gives the roots of weeds sufficient time to grow deep and strong. A superior strategy is to weed a little every day. That way, you ensure the problem never gets out of hand. 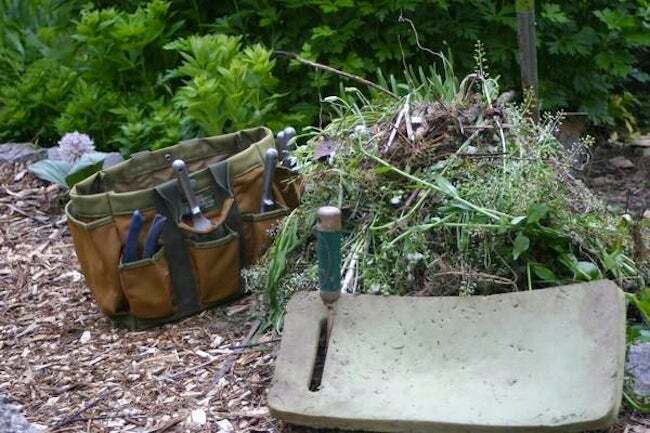 Bring along a kneeler and a shovel, a weed knife, or even an old fork to help you get to the roots. Don’t neglect walking rows (footpaths between plantings); if weeds get a stronghold there, they can easily spread. 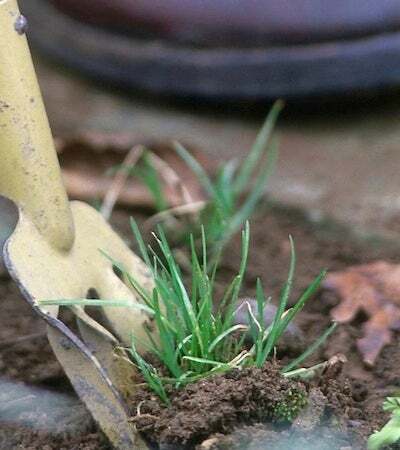 Note: If you weed more frequently and vigorously in the first months of spring and summer, you’ll be doing yourself a favor for the rest of the growing season, as you’ll prevent weeds from going to seed and spreading farther afield. Another way of uprooting weeds is to hoe regularly. Gardeners favor this approach, as it allows them to avoid the backbreaking work of pulling each weed manually. Be very careful not to hoe too deep, though: You might bring weed seeds to the surface, where they will enjoy access to the light and water essential for growth. Once a week, stir the soil at the base of plants to a depth of three inches maximum. Hoe only to one inch if you want to stay on the safe side. Take care to remove the roots of a weed so that it doesn’t return. Yank out a weed too quickly and it might break, with the result that you pull out the top but not the all-important root system. For best results, pull very gently (if the soil is soft) or use a tool to dig it up (if the soil is hard). If digging, do so sparingly; you don’t want to disturb the roots of the plants you wish to keep. Don’t weed when the soil is soggy, but do weed when the soil is wet. It’s easier to pull the roots up out of damp soil. Save hoeing for days when the ground is dry. Once you’ve pulled out a weed, don’t let it sit around on bare soil. Its seeds could find their way back into the ground. Let pulled weeds dry out and die in the sun, preferably on the sidewalk, then either throw them away or into a compost heap. Note: Do not compost weeds that have gone to seed. That’s a recipe for getting more weeds when you ultimately return the compost to your garden. If weeds have grown so big that you aren’t able to fully uproot them—or if they are so close to other plants that to remove the root of the weed would mean risking the roots of the plants you want to keep—then chop off the heads of the weeds. This will kill them slowly and prevent them from going to seed and spreading further. You may have to chop multiple times, but eventually they’ll die out. Herbicides usually require many applications, as they (literally) fail to address the “root” of the problem. Be careful: They can be toxic to pets, children, and other plants. Use sparingly, or experiment with organic herbicides, such as vinegar or boiling water. In all cases, make sure you’re spraying or pouring herbicide only on weeds, not inadvertently killing other plants in the process.